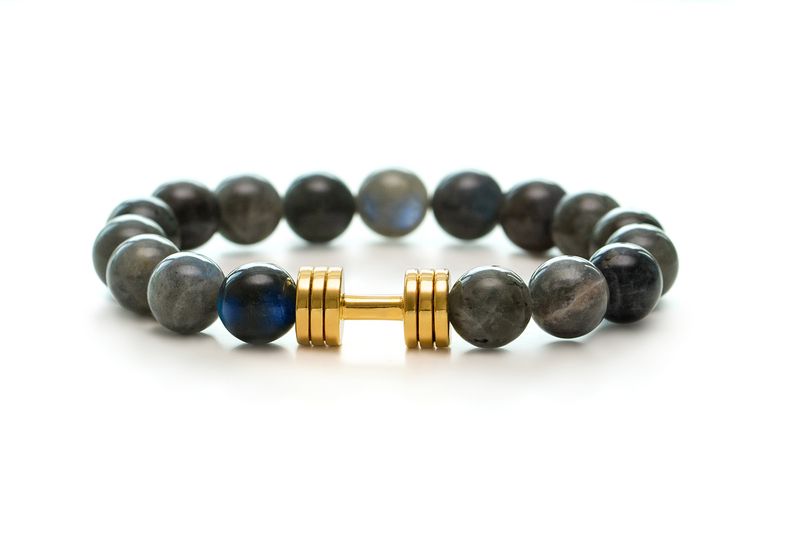 Introducing Fit Selection’s new jewelry piece – Labradorite dumbbell bracelet. With a dumbbell pendant and beautiful crystals, this bracelet is a perfect token as fitness lifestyle motivation and a good luck charm. Item is made of natural high quality Labradorite beads and 24K gold plated dumbbell. Each bracelet is handmade by our team, wherein we put two rows of strong elastic cord through the beads to ensure longevity. 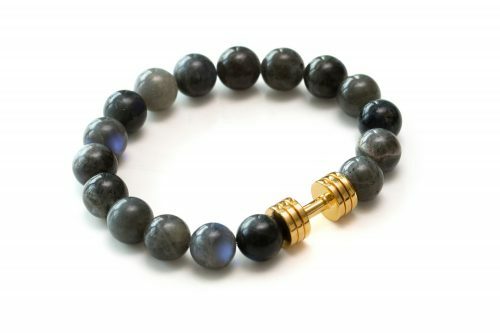 Energies of stress and anxiety are said to be reduced by labradorite, possibly due to is energy of self-confidence. Labradorite is said to increase intuition, psychic development, esoteric wisdom, help with subconscious issues, and provide mental illumination. Labradorite Crystal brings you the gift of serendipity and synchronicity. These two things combined can make amazing things happen in your life. Those little coincidences, where you are in the right place at just the right time, just seem to occur more often once you begin to use this stone. You may find that any gifts that are waiting to develop may begin to manifest, as you make better connections. Wearing Labradorite helps you to understand your destiny. That path that you chose before you came here to the earth plane. This crystal aids serendipity, coincidence and synchronicity to flow in your life. It also aids you to let go of thoughts that may impede you from taking action on those things that you are inspired to do. The dumbbell is plated with 24K gold to insure is long lasting and non-irritating even to sensitive skin. Standard bracelet size will easy fit 7-8 inches wrist, however, contact us directly in case you would require the customised size of the bracelet. The bracelet comes presented in a black Fit Selection box, making it an ideal motivational gift for your favourite spotter or a nice treat for yourself. 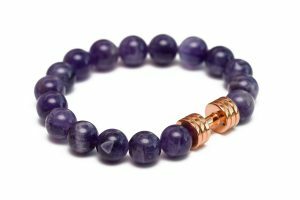 Rose Gold plated Triple Plate Dumbbell Bracelet with Grade “A” Amethyst stone beads. Amethyst is a meditative and calming stone which works in the emotional, spiritual, and physical planes to promote calm, balance and peace. This bracelet can increase your intuition and psychic power. Shipping: USA 3-5 business days; World: 10-14 business days; Express shipping available on checkout. 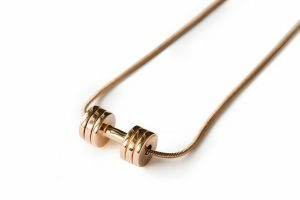 This proud creation of Fit Selection team is a handcrafted Dumbbell necklace, designed to be your wearable motivation throughout the whole day. It will make you stand out from the crowd and make you run an extra mile.